After being hit by a car, a friendly feline at the Victoria SPCA needs help to get moving again. Brought in by a Good Samaritan as a stray from the Sooke area, Marilyn is suffering from a broken hip and abdominal hernia. 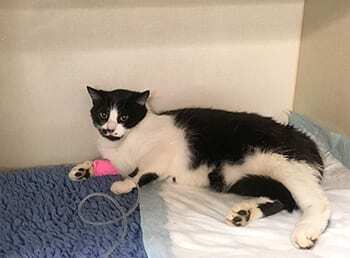 Believed to be around six years old, the striking black and white cat must undergo surgery, recovery and rehabilitation before she will be available for adoption. The medical costs related to her care are expected to exceed $3,500. A non-profit organization, the BC SPCA relies on public donations to carry out its life-saving work in helping British Columbia’s most vulnerable animals. “We just want this beautiful girl to have the chance to live out the rest of her nine lives as an active, happy cat in a loving, forever home,” Prittie Bell says. If you can help Marilyn and other animals like her at the Victoria SPCA, you can donate online, at spca.bc.ca/medicalemergency or in person, at 3150 Napier Lane, Victoria.